My trip to Korea has officially come full circle, a year ago I spontaneously bought tickets to South Korea to visit my friend who was teaching English to young children at a hagwon (private English academy). My adventure to South Korea is one I will never forget, it was an experience that made me grow as a person and I cherish every memory. Had I not gone I would not be able to share with you the story of how I sprinted across Seoul to catch my bus to North Korea. Yes, I sprinted through the morning rush hour from one side of Seoul to the other to catch a bus to North Korea. After I bought my flight to S. Korea I began looking into visiting one more country while I was in the region. 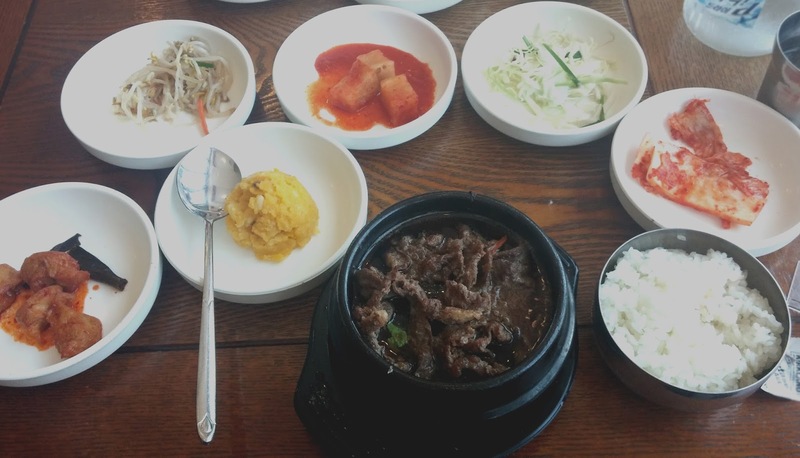 But in the end I decided to spend my whole trip in Seoul with my friend and have the chance to explore as much of the city as I could. 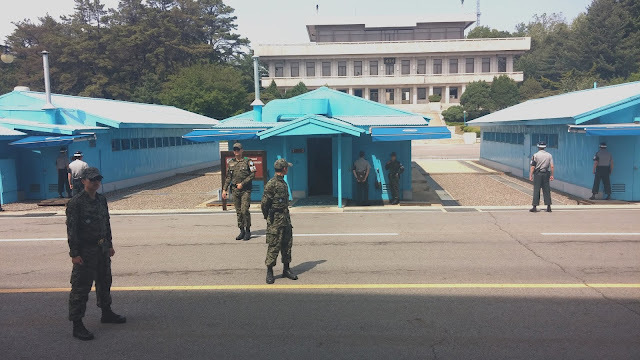 While doing research about what to do in Korea I stumbled upon a tour to the DMZ. The DMZ is the demilitarized zone along the border of North and South Korea along the Military Demarcation Line (MDL) which divides the Korean peninsula 155 miles (241km) from East to West. In July 1953 both sides signed the Armistice Agreement to cease fire and pull back 1.24 miles (2km) from the MDL to insure peace. Today the DMZ is a buffer zone ending all military and hostile actions. I was quiet surprised to learn that the DMZ ecosystem has been prospering and is very fertile land for growing rice, soy beans and wine. There are is one village within the DMZ zone, Daesongdong “freedom village”. The people of Daesongdong tend to the rice fields and farming in the area and are exempt from federal taxes and mandatory military draft from either Korea. Many people compare the border of North and South Korea to the border of former East and West Germany. I was born after the fall of the Berlin Wall and Iron Curtain but I grew up hearing many stories about that time from my family in Czech. In some ways I felt like I had an understanding of the sensitive situation in Korea. When I came across the tour I hesitated about going. My friend was working most of the days I was visiting her so I wanted to fill the time with touristy things around Seoul. Would a trip to the North Korean border be ok with my parents? My stepdad was more than excited to hear about my trip to Korea and when I mentioned the tour he said he had taken it while he was in South Korea in the late 1980s. My mom happy for me that I was traveling to Korea and visiting my childhood friend but when I shared the news of my adventure to the North Korea border she was less than thrilled. Now, let’s fast forward about ten days after I told my mom I was going to go to the border of one of the most hostile countries in the world - alone. I was out the door of my friend’s apartment at 8:01 am to catch my tour bus, little did I know that that one minute would cause me such stress. To get to where the bus was picking me up would take 45 minutes. As I walked to catch the bus to the metro, I see it pulling away from the stop but thankfully another one came within 2 minutes. Once at the metro stop I hurry down the steps and just as I land on the last step of the stairs the train doors close. Great, next train is in 3 minutes and I am already running late. Keep in mind that there are only three tours a week and you must be cleared by the United Nations seven days prior to your tour to even be allowed. This wasn’t an easy tour I could reschedule. My train came and I have to make one more metro line change, at this point I begin wondering if this is a sign that I shouldn’t be going. Should I listen to the signs? No, this is a once in a lifetime opportunity and there is no refund if I miss the tour. I make the change and as I run down the stairs to catch my last train I see the doors close. I look at my watch, I still have about ten minutes until I get to the stop I need. The Korean metro map looks like one of the most complex transit systems in the world. (See the map here) Thankfully Koreans are tech savvy and created an app that helps passengers navigate through the web of colored metro lines, thankfully I had that app. A day before the tour I did a practice run of where the place was so I would know where to go, I was so grateful to my past self for preparing the day before because the moment my future self climbed out of the metro I orientated in the right direction and started to make a run for it. On my ticket it said to meet at the grand piano of a hotel, I sprinted through lobby doors to find that there wasn’t a group waiting around the piano. 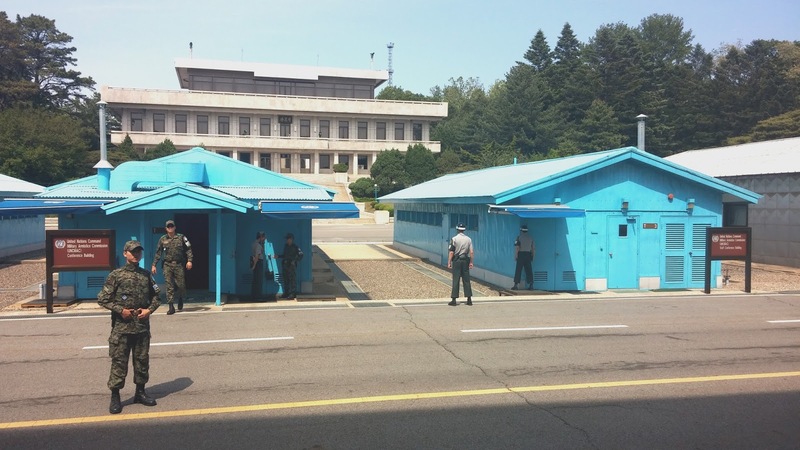 I grabbed a concierge and explained to him that I was late for the Panmunjom Tour. As soon as I said this a gentleman came up to me and said he was part of the tour and that our bus was waiting on me outside. When our tour guide saw us she quickly hurried us onto the bus because we were on a tight schedule. I couldn’t believe I had made it. The border is a 45 minute drive north of Seoul, surprisingly close in distance yet a world away. As we head north I notice what looks like a small village across the river. Our tour guide explains that the North Koreans have set up propaganda villages along the border to make it appear as though people are able to live freely and close to the border. Through modern technology such as heat sensors, it was proven that no one actually lives in the village and that they are just for show. Our first stop is in Imjingak Park where the Bridge of Freedom crosses the Imjin River and is a memorial park for those unable to return to their hometowns or to see family and friends. The bridge was a former railroad bridge used to exchange prisoners after the Korean War, today a train stands on the railroad tracks in memory of those it brought back. There is one place to eat while visiting the memorial, Popeye’s Louisiana Chicken. Yes, if you are hungry and you can grab a snack at the American fast food chain Popeye’s from New Orleans, Louisiana just a few yards from the border of North Korea. Back on the bus we head to the town of Paju located just south of the 38th parallel, the line of latitude that created the border between North and South Korea. Once we cross the border control into Paju we make a stop at the Dora Observatory where we get to see into North Korea and Kaesung City, the second largest city in North Korea. From the observatory you can also see Kijongdong, another propaganda village. Our second to last stop of the morning tour is the 3rd tunnel. Made by the North Koreans and discovered in 1978 by the South Koreans, the 5364.17ft (1,635m) long by 6.4ft (1.95m) – in some parts even lower- high by 6.9ft (2.1m) wide tunnel which passes into the Military Demarcation Line by 1427.17ft (435 m). Our group was taken to the entrance of the tunnel where we began the long walk down through bedrock and about 239.5ft (73m) underground and equipped with hard helmets. At the end of the tunnel you can see what you hope is a thick concrete wall that separates you from the North Korean end of the tunnel. The morning tour ended at the Dorasan Station, the railway station that is the northernmost stop on South Korea’s railway line and is a symbol of future trading between the two nations. If North Korea allows for the railway to continue through its country you will be able to take a train from Seoul, South Korea to Paris, France. "Not the last station from the South, but the first station toward the North"
The bus drops me off in Paju where I am served a Korean style lunch and wait for my next bus to come and take me to Camp Bonifas. As I settle into my seat on my afternoon tour bus our tour guide begins to explain the safety and rules we must follow while in touring and that we may be evacuated from the camp if there is even a small threat to our safety and will received no refund if this happens. The camp is property of the United Nations, hence why the U.N has to clear you before you sign up for the tour. Also there is a dress code: shoulders must not be visible, any offensive clothing cannot be worn, absolutely no oversized clothing, sheer clothing, flip flops/sandals or military clothing are allowed. While we were in Camp Bonifas we were prohibited to take photos unless our guide allowed us. The most exciting part of the tour was our last stop, the Joint Security Area. Little blue huts welcomed us as we emerged from a large gray building and the border line between North and South Korea was just a few steps away from us. These little blue huts are the conference rooms which are used by both sides when meetings and negotiations need to be made. Inside the conference rooms the room is split by an imaginary line that divides the room between the north and south, with no visibily present line the space feels equal and neutral. Inside the rooms there are no flags and the only color is blue, the color of the United Nations. The area is heavily guarded with both North and South Korean soldiers standing watch over us. It was an unimaginable and thrilling experience being in JSA and being able to put one foot on North Korea land and the other on South Korean land. Having been taught so little about the Korean War in school it was truly eye opening to discover Paju, JSA and the DMZ. After having to make my way across Seoul by bus, train and foot to visit the DMZ every second of my morning adventure to get to the bus was worth it. I will never take what I have for granted and am so grateful that I live in a country where I have the freedom and opportunities. My heart goes out to everyone effected by the war and those who are still separated from their friends and family. This is such a nice place to visit. Thanks for sharing! I would love to visit there soon. Thanks for sharing. also i loved your vlog, your new rings are stunning congratulations! I don't even know where to begin commenting on this one, oh god, this was an amazing account. I was holding my breath as I read your account of your tour and I'm not even sure why I'm doing so when I know very well that the media perpetuates North Korea as a tragic, sad and impassive country. 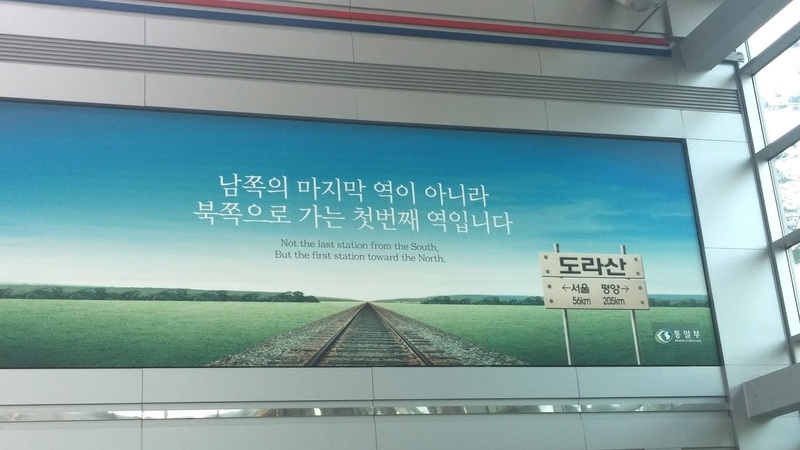 The slogan at the Dorasan station gave me the chills; I'm so glad you documented that. As for the propaganda villages -- I had no idea that those existed. Which is quite ignorant on my part, really, seeing as how propaganda culture is rampant in this day and age. Gosh, this was such a good, good, good account. I absolutely loved reading it. Thank you so much for sharing this with us! I'm hoping that one day I'll be able to tour the border, too! Thank you, it was a really eye opening experience and one I will never forget. The tour taught me so much about the Korean War and how North and South Korea are the way they are today. Such an interesting post! Thanks for sharing. I dont know where to talk, because as long as I know North Korea is such a reclusive isolate area where the government takes the control and has a propaganda might of all the country and the people's freedom are ruled restrictively. Since I'm also a fan of Hallyu (South Korean waves), I much less know about the country background and the conflict behind. I always wonder how the experience of visiting North Korea turned out to be, and then you were sharing this and just got the feels. Before my trip to Korea I didn't know much about the conflict between the two sides, seeing the history first hand was an incredible lesson. I hope one day you get a chance to visit Korea and see the border. Always wanted to go but never knew how! That's for sharing your experience! 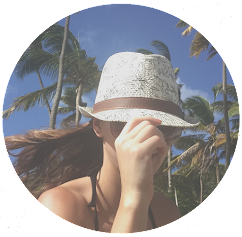 I love travel posts, these photos are beautiful! Wow!! Great Sharing!! Would you allow me to repost this article on my website linking back to you? You're awesome! I have credit you as our guest poster and link you back as well on our website LadyRedot.com, it will publish on the 20 July. Watch out for it!